Shoreham Football Club were sent crashing to a Bostik League South defeat at the hands of Walton Casuals last night. Already-relegated Mussels were beaten 2-0 by play-off chasing Casuals at Middle Road. Failure to take anything from the clash saw Shoreham fall 16 points adrift at the foot of the table, with second-from-bottom Molesey picking up a point in their meeting with Herne Bay. 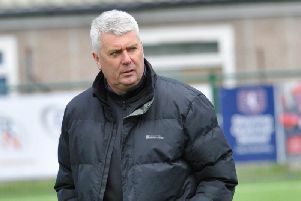 Shoreham boss Sammy Donnelly just hopes his side can win one of their final three games this season. He said: “I thought we defended quite well but offered very little in attack. Youseff Bamba’s effort in first half stoppage-time gave Casuals a half-time lead. Jack Sammoutis added a second on the hour to seal a 2-0 win for his team. Mussels host Ramsgate on Saturday then welcome Whyteleafe in the league next Wednesday.